Tomorrow is Martidì Grasso, Fat Tuesday, Marti Gras. From Rio de Janeiro to New Orleans to Venice, people are celebrating Carnival with gusto. 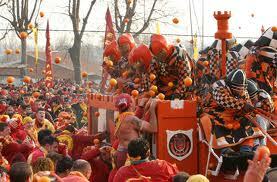 The Battle of Oranges in Ivrea, Italy, stands out as one of the most unusual Carnival celebrations anywhere. The event combines several moments in Ivrea’s history beginning with 1194 revolt by the peasants. According to legend, the revolt was sparked by Count Raineri di Biandrate, a bloody tyrant who, among other things, claimed his right to bedding brides on their wedding night. Known as the jus primae noctis, this practice symbolized all elements of this and other tyrants’ mistreatment of the common people. His last intended victim, Violetta, a miller’s daughter, chopped off his head with a sword she’d hidden under her dress rather than submit to his demands. Her act of defiance led to an uprising by the peasants against the Count’s troops. The peasants threw stones, and they won. A second revolt came in 1266 against Marquis of Monferrato. Both of these revolts are commemorated at Ivrea’s Carnival. A young woman is chosen to be Violetta each year, and her identity is a closely guarded secret until she’s presented to the throngs on the Saturday before Lent. She dresses in a white woolen robe with a sash of red, white, and green, Italy’s colors of freedom and liberty. Her head is adorned with a red cap with a long pointed peak that drapes over her shoulder (more about this cap later). She rides in a golden carriage and tosses candy and sprigs of mimosa to the crowds. Other people represent characters in the second revolt, and they follow along behind Violetta in the procession on foot. 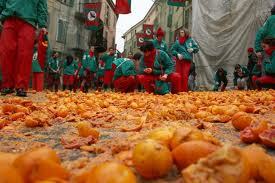 The Battle of Oranges then begins in earnest and continues over three days. The warriors representing the nobility arrive in decorated carts. They wear helmets and protective padding. The common people are on foot and unprotected. Each of the city’s districts has a distinctive team with unique costumes: Ace of Spades with a red jacket emblazoned with their symbol or the Chess team in black and white checked jackets marked with a red castle. Originally, each district had its own Carnival celebration and battle, but they were unified into one city-wide event during Napoleon’s reign in 1808. Anyone can join the battle, but you must choose a team. Spectators who do not want to participate must wear red caps like Violetta. These caps originated in Phrygia in what is now Turkish Anatolia. This sun-worshiping people wore these caps as part of their religious ritual. In ancient Rome, freed slaves wore these caps to indicate their emancipated status. Later these caps became symbols of the French Revolution, representing liberty. In Ivrea, this cap is known as berretto frigio. If you’re wearing one, it means you aren’t throwing oranges, so in theory, no one will throw oranges at you. The people of Ivrea have incorporated many elements of their history into the Carnival. Huge cauldrons of beans are set up at various points throughout the city, for example, and generous portions are ladled to anyone who wants a taste. This part of the festival represents feeding of the poor during the Middle Ages. 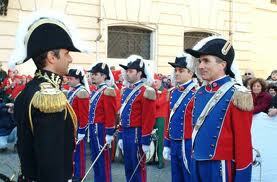 And people representing Napoleon’s soldiers parade in the characteristic uniforms of the period. The most recent addition is text messaging. All the carts have numbers, as do the battles. You can text your vote on the best one. All the partying comes to an end on Tuesday night with a giant bonfire. Then people hug and kiss each other saying, "arvedse a giòbia a'n bòt" (local dialect for good-bye till Thursday at one). That means see you at the beginning of the Carnival next year. Italy is so rich in culture. Strange but rich. LOL. Thanks for sharing this, Andrea.